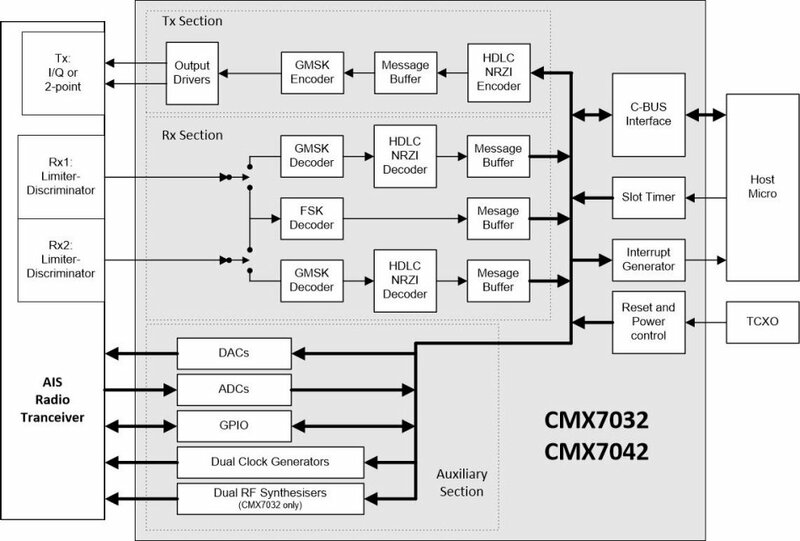 The CMX7032 and CMX7042 are highly integrated baseband signalling processor ICs that fulfill the requirement of an SOTDMA and CSTDMA AIS transceiver, dual AIS Receive only device and exactTrax™ long range AIS Class-B tracking. These devices provide a quick route to developing an AIS based system and getting to market fast. Embedding much of the AIS, DSC and exactTrax™ protocol ensures minimal host involvement, therefore the designer can concentrate on the overall end application. Built on FirmASIC® technology, the CMX7032/CMX7042 provide the ultimate flexibility when designing Marine AIS based systems. Q. I am about to start a design using one of your FirmASIC® based products, what is the most suitable method of storing the associated Function Image™ in my project? A. Our FirmASIC® based devices require a Function Image to configure their On-chip sub-systems. This data file is uploaded during device initialisation and defines the device’s function and feature set. The Function Image can be loaded automatically from external serial memory or from a host µController over the C-BUS/SPI port. The serial memory can be programmed using a dedicated programmer.The serial memory can also be programmed using the target CMX7xxx device and the host processor. This facility makes programming the serial memory possible during factory test or through field upgrade. -The method for loading an FI over C-Bus/SPI is detailed in the device’s data sheet. -The method for programming the serial memory is described in this application note. For FI-2.x only. Directions for loading an FI over the RS-232 port can be found here. Q. The CMX7032 FI-2.x includes a NRESET pin, I understand that this allows the device to be fully reset following a temporary loss of power (e.g. Brown Out Condition). Is there a particular way to use this pin if I am using an external Serial memory to store the Function Image? A. The hyperlinked pdf document CMX7032 Power up and reset provides an illustration of how the NRESET can be used during a Brown Out Condition. It can be used at any time following an initial [power up sequence and Function Image load). CML recommends the use of an external voltage supervisor IC if it is exposed to variable supplies such as those found in automobile applications. Q. I am about to evaluate the AIS Baseband Processor what Evaluation Kit is recommended? A. For RF evaluation, the DE70322T provides a complete solution and is offered as a demonstration module / reference design. The DE70322T is a complete solution for a high quality, standalone AIS receiver. The DE70322T with the PE0003 for evaluation using FI-1.x or FI-2.x in AIS receivers. The DE70322T with the PE0003 for evaluation using FI-1.x and FI-3.x in AIS Class B transceiver designs. For evaluation at baseband, either the PE0201 or PE0401 kits are the best option. These kits can be used with RF test sets or vector generators and signal analysers. The tx and rx channels require a relatively flat frequency response that extends near to dc. For 7042FI-1.x use a PE0402 kit where solder pads are provided to allow a solder bridge to be made in series with each input decoupling capacitor. The outputs are already dc coupled so no further changes are required. See the PE0402 User Manual and schematic. Receive DSC data bursts on RX1 using the PE0201/PE0402 and PE0003 Ev Kits. The data length and RX State errors are saved to a file "RX1 DSC Burst". The download includes a wav file that generates 3 DSC bursts for testing DSC receivers. Receives AIS data bursts on RX1 and RX2 using the PE0201/PE0402 and PE0003 board. Saves data length, dc offset, Time of Arrival, AIS data and RX State errors to file. Receive AIS data bursts on RX1 using the PE0201/PE0402 and PE0003 boards. Saves data length, dc offset, Time of Arrival, AIS data and Rx State errors to file. Receive AIS data bursts on RX2 using the PE0201/PE0402 and PE0003 boards. Saves data length, dc offset, Time of Arrival, AIS data and Rx State errors to file. A wav recording of the Eddystone message described in the CMX7032 User Manual. This file can be used to test the baseband receiver of the CMX7032 or modulated to RF and used as test signal.